American Spray Tech provides a variety of services and items related to parking lot maintenance. Parking lot maintenance is more than sealcoating, striping, crack filling, and repairing the asphalt. Adding safety and navigation tools are also necessary to complete your parking lot. These items add value to your customer and insure that your customer will navigate safely around your property. Are you having maintenance issues and you just don't know where to go for help? American Spray Tech would love to serve you. If you don't see the service or parking lot maintenance item that you need, do not give up! Give us a call to discuss your specific parking lot maintenance needs. We can custom order and custom design items as needed. Your company may have a number of bollards installed. 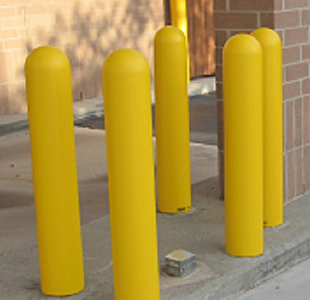 AST can paint (or replace) bollards in your parking lot and shipping areas. AST can also replace (and install) your bollards with bollard covers. The bollard covers can be personalized with your company logo if desired. Whatever your choice, repainting or replacing these will brighten the appearance of your property. Traffic control within your parking lot can be aided by flexible posts. These can be used to help separate traffic flow patterns. AST can replace (and install) flexible posts per your request. Wheel stops (or bumper bars) can be used for a variety of situations in your parking lot. Wheel stops are used to stop vehicles from advancing too far in a parking spot (or parking stall). They are also used in front of a lamp pole, lamp post, sign post or other obstruction in a parking lot that you don't want your customers getting near. The appearance of your parking lot is tainted by your chipped and peeling wheel stops. AST can repaint your wheel stops throughout your parking lot making them visible. AST can also replace wheel stops when they are broken. Sometimes this is an aesthetic repair, but many times, the rebar is exposed or the broken concrete is causing a trip hazard. AST can provide concrete or rubber wheel stops for replacement. Either guard will be of quality construction and installed correctly. The stops will be installed straight and true and anchored into your parking lot surface. AST can paint your speed bumps throughout your parking lot and/or neighborhood association property. AST can also repair/replace (and install) your speed bumps. 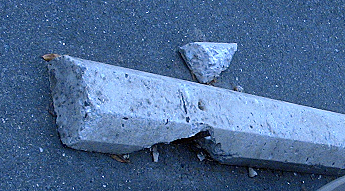 Speed bumps can be made out of asphalt or they can be replaced by a rubberized traffic control product. AST can also install these for you. American Spray Tech has been able to aid property managers with temporary line markings. Some managers responsible for sports events, entertainment personnel, or property under construction, have needed temporary parking. AST is able to provide you with this short term solution. Temporary line markings may be needed on a surface other than concrete or asphalt give us a call so we can discuss what you need. American Spray Tech can provide industrial quality line markings on interior surfaces. Warehouse line marking can be applied with either paint or tape, depending on the surface and the customer need. Give AST a call to discuss in detail. As a service to commercial clients, AST has provided interior signage for inventory control areas. This has included a system with hanging signs for a neatly designed / laid out inventory area. Top quality signs were fabricated and installed. 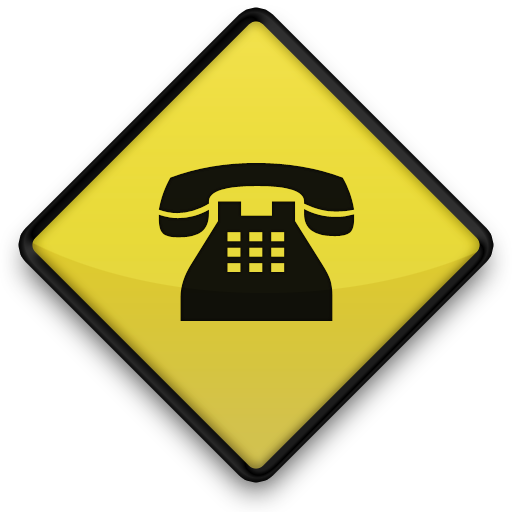 Give AST a call to discuss a solution to your warehouse signage needs. 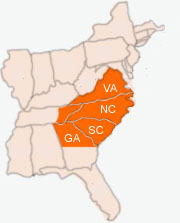 Contact us in Winston Salem, NC for information about your seal coating, asphalt repairs, parking lot striping and parking lot maintenance needs.